Since 1995 the European Open has been held at the K Club in Ireland but 2008 sees a new venue for the tournament. 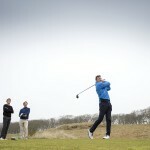 The London Club in Kent will play host to the European Tours best golfers. Justin Rose, Colin Montgomerie et al. will do battle around the Jack Nicklaus designed Heritage Course. With an impressive £400,000 going to the winner of the event, the tournament has attracted one of the strongest fields assembled on the European Tour so far this season. Sergio Garcia and Padraig Harrington will be teeing it up along with Robert Karlsson and Michael Campbell. Following a second place finish in France last week, the defending European Open champion Colin Montgomerie will be hoping for another good showing to continue his climb up the Ryder Cup rankings. Entry for spectators will be free on the Thursday. Justin Rose: The 2007 European number will start amongst the favourites to lift the trophy. Hell be keen to secure a win on home soil. Oliver Wilson: Another young Englishman with something to prove. Hes been second four times in 2008 and this would be the perfect opportunity to go one better and get a title under his belt. Oliver Fisher: The 19-year-old lost in a playoff to Thomas Levet at the Open de Adalucia. Hed love to take his maiden tour title at a venue thats only 45 miles from his home in Chigwell. Key hole: 16th. A 465 yard par four with a plethora of strategically placed bunkers at driving distance. Lay up and youll be left with a long iron for the second shot. Maximum accuracy is required if you try and thread the needle. Skills required: Course management. There are a number of holes on the Heritage where you must be strategic. Laying up short of water or bunkering is often the prudent choice. Tiger Woods, the tournament host, will not be on the start list at the AT&T National. The World number one has confirmed he will not play again for the rest of the year, he wont be at the Ryder Cup and hes dismissed suggestions he should be there as assistant captain. KJ Choi returns to Congressional as defending champion. Its the second time the Korean has defended a tournament on the PGA Tour in the last six weeks. The Blue Course at Congressional is generally considered to be one of Americas finest courses. The layout began life back in 1922 when Devereux Emmett drew up the plans to convert land which had previously been used for fox hunting. Since then Congressional has played host to a PGA Championship and three US Opens. Over the years the course has been renovated a number of times, most recently by Rees Jones. Steve Stricker  The World number seven finished as runner-up here last season and will be looking to secure his first victory of 2008. Stuart Appleby  Appleby leads a contingent of 13 Australians in the field. He led after 54 holes of last years tournament before falling away in the final round. Hunter Mahan  A good performance here last year and a strong title defence at the Travelers Championship last week suggest Mahan will put on a good showing at Congressional. Key hole: 18th. Its the courses signature hole and at 466 yards its a long and demanding par four. Anything too far right off the tee could find trouble as well as a thick grove of cedars. Bunkers right of the green combined with water on three sides make the second shot a test of courage. Skills required: Steady scoring. The Blue Course was the ninth hardest on Tour in 2007; the average score in last years tournament was 1.5 over par. The key is to hang in and not make too many major mistakes.